Great neighborhood walk to metro ,convention center, 14th St shops /restaurants. One bedroom, one bathroom, two beds sleeps four. 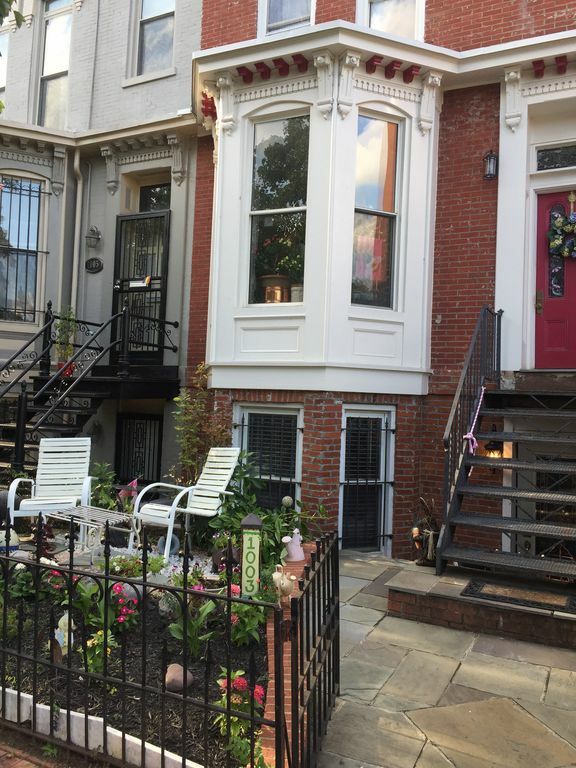 This is a totally private English style apartment in a historic DC rowhouse and neighborhood. There are no shared spaces. There are four steep steps down to the apartment. The apartment is approximately 600 square feet. The Living room with bay window, full size bed with memory foam mattress , tv, cable and wireless internet. Table and four chairs. Kitchen with dishwasher, GE gas stove and microwave.. LG washer and dryer. Bedroom with queen bed and memory foam mattress. Sitting area outside apartment and screened in sitting area outside bedroom door. Walk to numerous restaurants and shops. Short metro or bus ride to National Mall. One metro stop to the Convention Center. A visitor parking pass for street parking is available at no charge. A $100 fee will be charged if the pass is not returned. Street cleaning takes place on Wednesday and Thursday mornings. Be sure to move your car accordingly. To prepare for your stay and future guests please provide your expected arrival and departure times. Easy metro ride from DCA to apartment. Metro is two blocks away. Buses, bikes, CVS ,Trader Joe’s, and bustling 14th Street shops and restaurants all within five blocks. The convention center is an eight block walk or one metro stop. There is a combination lock on the door for easy self checkin. Pictures are recently updated and accurate . Great neighborhood, comfortable accommodations, outdoor sitting areas. Visitor parking pass provided if needed. Walk to restaurants, shops, convention center. Metro two blocks away if walking is not your preference. The metro stops two blocks is currently under construction. The Howard University/ Shaw metro stop is three blocks away at 7th and S Street NW. Washer and dryer in unit. Sittings areas in front and back of apartment. Street parking guest parking permit provided. Dishwasher, GE gas stove and microwave, dishes, pots and pans. Garbage disposal. Please recycle bottles, cans and paper in one bag. Put food down disposal. Front load LG washer and dryer. Bose speaker to play music with your phone. There are four steps down to apartment. What a comfortable way to end adventurous days. My 2 children and I had a blast exploring the DC area. We were amazed when we woke up each morning and slept just as good as if we were home. Lynn was a perfect hostess. It is clear that she enjoys hosting folks in her VRBO as seen in small touches such as brochures, toiletries, and metro cards and her general concern for our well being, such as a reminder to move the car on street cleaning day. The house was clean, smelled great and stocked with everything we needed to have an amazing trip. We will be back! 4 nights wasn’t enough for us to explore everything we wanted to see. Loved the apartment. The location was convenient and the host helpful. Clean, comfortable accommodations close to the metro and food. Owner also had timely and thorough communication. Would definitely stay again! Thank you. We loved walking to coffee at The Coffee Bar in the morning. Great restaurant options not too far way. Rode the metro to just about everything. We had a great time. Thanks, Lynn! very nice place, with most everything we could want. Kitchen, bathroom well equipped. Lynn was very helpful as well. We had a great stay. Location is perfect for sightseeing, restaurants, conventions and shops. Located two blocks from metro.